Welcome to our live blog following developments from The Hague and the Balkans as the UN court prepares to hand down its final verdict in the trial of Radovan Karadzic. 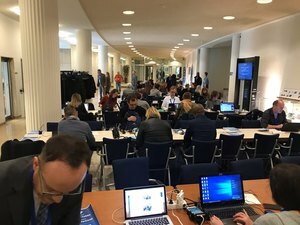 Our correspondent Denis Dzidic will be filing live updates from the Hague court, while our reporters in Sarajevo and Belgrade will be providing all the latest reactions from the region. Karadzic was found guilty of genocide and other wartime crimes in the court’s first-instance verdict in 2016, but both the defence and the prosecution appealed. The defence is calling for acquittal, while the prosecution wants the former Bosnian Serb political leader to be given a life sentence. Read our analysis of their reasoning. Before he became the wartime leader of the Bosnian Serbs, Radovan Karadzic, who is now 73, worked as a psychologist and published poetry. Read our profile of the man now facing judgment for some of the worst crimes in Europe since World War II. 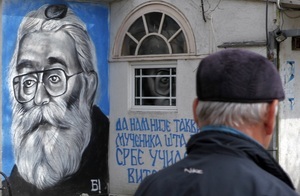 Karadzic spent years on the run, posing as a New Age mystic, before being arrested in Belgrade in 2008. But a lot of the time he spent as a fugitive is still shrouded in secrets that the Serbian and Bosnian authorities seem reluctant to probe, while people who helped him remain unprosecuted. Read our feature about his years in hiding. Analysts have predicted that the final ruling in the Karadzic trial will only perpetuate continuing post-war ethnic divisions in Bosnia and Herzegovina and fuel nationalist rhetoric. Our analysis has more details. Former President of the Croatian Government Jadranka Kosor posted a message of support for the Mothers of Srebrenica war victims’ group on Twitter ahead of the Karadzic verdict on Wednesday. “Today, in my thoughts and my heart, I am with the Mothers of Srebrenica. So that their suffering and the suffering of thousands of those who are mourning their loved ones is eased at least for a moment,” Kosor wrote. 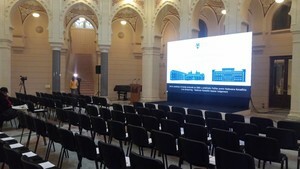 A live stream of the verdict will be broadcast from Sarajevo City Hall. Representatives of war victims are also gathering in Srebrenica and Prijedor, where they will watch the verdict, local media report. The pronouncement of the verdict will begin at 2pm local time in The Hague, but in a departure from usual practice, it will not be broadcast live on the UN court’s website - instead, the court will broadcast the proceedings with a time delay of 30 minutes. This is because of the courtroom suicide in 2017 of former Bosnian Croat general Slobodan Praljak, who took poison as his verdict was announced, live on the court’s website. 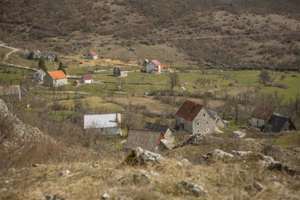 In Radovan Karadzic’s home village of Petnjica in Montenegro, where he was born in 1945, he is not seen as a war criminal but as a local boy who made good and strived to protect the Serbs in Bosnia and Herzegovina, a BIRN reporter discovered back in 2016. 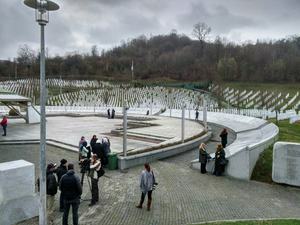 Representatives of war victims and their families are gathering at the Potocari Memorial Centre near Srebrenica, where thousands of victims of the 1995 massacres are buried, to watch a live stream of the Karadzic verdict. British barrister Geoffrey Nice, who was involved in several prosecutions at the Hague Tribunal, said he thought Karadzic is likely to be convicted and sentenced to life imprisonment. “If there are no appeals favourable to Karadzic, then we can expect to see a life sentence,” Nice told BIRN outside the UN court. 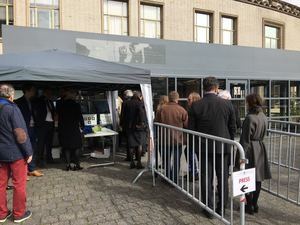 Members of the public and journalists are now making their way to the courtroom – because of the large attendance, they have been asked to be inside by 1.15pm local time ahead of the start of proceedings at 2pm. Nura Alispahic, whose two sons were killed by members of a Serb paramilitary group called the Scorpions, told BIRN outside the court that she wants a life sentence for Karadzic. 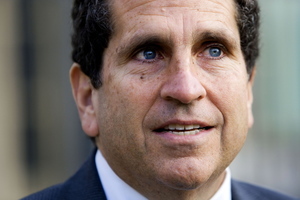 US lawyer Peter Robinson, legal adviser of Radovan Karadzic. Photo: Valerie Kuypers/EPA. 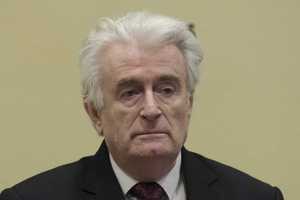 Karadzic has called for an acquittal on all counts. His American legal adviser Peter Robinson told BIRN earlier this week that the former Bosnian Serb president was “calmly waiting for the judgment”. “He is completely calm. He hopes for the best, but he is prepared for the worst,” Robinson said. 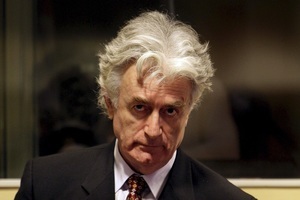 Karadzic has repeatedly insisted that the international court was biased against him from the start. 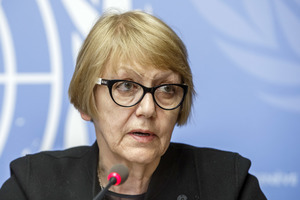 President of the Helsinki Committee in Serbia Sonja Biserko. Photo: Salvatore Di Nolfi/EPA. Sonja Biserko, president of the Helsinki Committee in Serbia, told Bosnian newspaper Dnevni Avaz that she expects the appeals judges to uphold the first-instance conviction of Karadzic. "I expect confirmation of the verdict with possibly minor changes in relation to the first-instance proceedings, anything other than that would lead to the further violation of the Hague Tribunal's reputation," Biserko said. Among the groups of war victims who are present at the court for the verdict, there is a sense of excitement and nervousness, with many telling BIRN they do not know what to make of the fact that one of the appeal judges was changed several months ago. "We just fear politics coming into it," said Murat Tahirovic, president of the Association of Victims and Witnesses of genocide. Employees of the Mechanism for International Criminal Tribunals refused to give on-the-record statements about their expectations, but some said they do not expect major differences from the first-instance verdict. 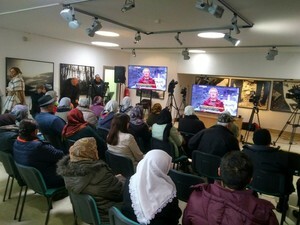 Mothers of Srebrenica victims prepare to watch the verdict at the Potocari Memorial Centre, where thousands of people who died in the 1995 massacres are buried. 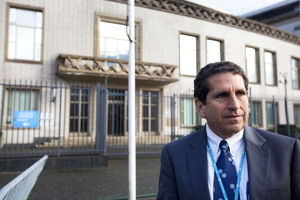 British barrister Geoffrey Nice, who was involved in several prosecutions at the Hague Tribunal, is outside the Hague court today. He gives us his thoughts on the sentence Radovan Karadzic should be given. Police in The Hague have removed part of a banner outside the court which compared Karadzic to Adolf Hitler. 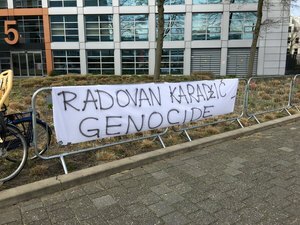 The banner, which was hung by the Bosnian Anti-Dayton group, now just says “Radovan Karadzic – Genocide”. Ahead of the verdict, Karadzic's lawyer Goran Petronijevic told us he expects a “favourable decision”. Outside the Hague court, Bosnian war victims share their reactions on Karadzic's verdict. Following Radovan Karadzic's final verdict, his American defence lawyer Peter Robinson delivered a statement on his client's behalf. Radovan Viskovic, prime minister of Bosnia’s Serb-dominated entity Republika Srpska, expressed pessimism about Karadzic’s chances of acquittal. "Knowing the practices so far and how the Hague Tribunal worked, I'm not optimistic," Viskovic told Bosnian daily newspaper Nezavisne Novine. The verdict is scheduled to start in less than ten minutes, and it will be read out by veteran Hague judge Vagn Prusse Joensen. The other members of the five-person chamber are judges William Hussein Sekule, Jose Ricardo de Prada Solaesa, Graciela Susana Gatti Santana and Ivo Nelson de Caires Batista Rosa. 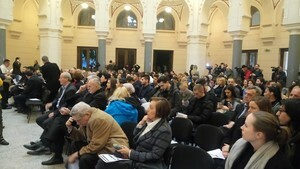 A large audience of war victims, locals and students has gathered at Sarajevo City Hall to watch a broadcast of the verdict. The five judges have now entered the courtroom as the proceedings get under way. Judge Vagn Joensen said he will not read out the whole verdict but only the summary. 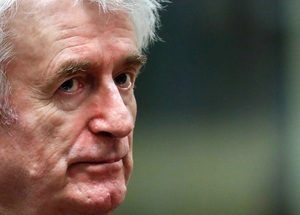 At the start of the hearing, judge Joensen recalled the first-instance verdict which was handed down in 2016 and which sentenced Karadzic to 40 years in prison. Joensen said he will first address Karadzic's claim that the case was unfair. 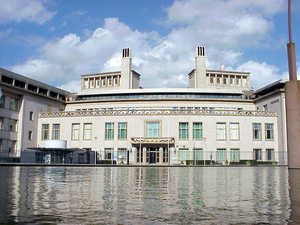 The judge said that the court violated Karadzic's rights by conducting visits to crime scenes without him, but added that this did not significantly harm his defence. 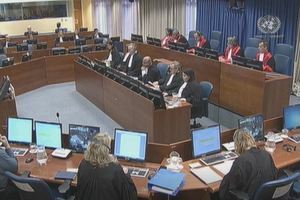 Speaking about the crimes in 20 Bosnian municipalities of which Karadzic was convicted, the judge said that Karadzic failed to prove that the trial chamber made the wrong conclusions in its verdict. “The defendant simply lists his own disagreements with the trial chamber [in his appeal],” said Joensen. The appeals chamber found that facts were only wrongly determined in two incidents, so Karadzic was acquitted of them, but for all the other crimes in the 20 municipalities, Karadzic failed to prove his rights were violated, the judge said. 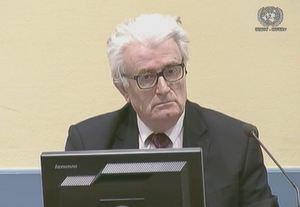 Speaking about the charge accusing him of terrorising the civilian population of Sarajevo, judge Joensen said that Karadzic failed to prove that the trial chamber made a mistake in finding him guilty of the massacre at the Markale market in Sarajevo - one of the worst atrocities in the Bosnian capital during the siege of the city. The judge said that the defence’s appeal failed to prove that the trial chamber erred in finding Karadzic guilty for taking part a joint criminal enterprise to terrorise the population of Sarajevo. 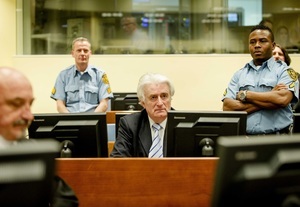 The judge said the trial chamber reasonably concluded that orders that Karadzic gave, saying that civilians should not be attacked, were given at times which were politically beneficial to him - when he was negotiating or when under pressure by the international community. 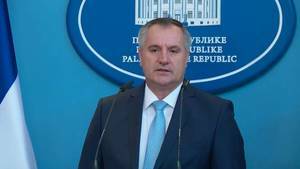 Speaking about the Srebrenica genocide charge, Joensen said that the key evidence was ‘Directive 7’, a Bosnian Serb decision in March 1995 which Karadzic signed, saying that conditions should be made “unbearable” for people living in Srebrenica. The judge said that the appeal did not prove the trial chamber erred in finding that Karadzic’s signing of Directive 7 was a key part in creating conditions in which many people lost their lives. Speaking about Karadzic's participation in the joint criminal enterprise responsible for the killings in Srebrenica, judge Joensen said that considering that Karadzic was in constant touch with people on the ground, there was no error in relation to conclusions that he was guilty. Karadzic failed to prove that the trial chamber erred in concluding that as the commander in chief of the Bosnian Serb armed forces, he was supposed to investigate and punish perpetrators of crimes, the judge continued. 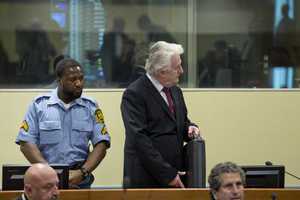 Turning to the final part of the verdict – the conviction for taking UN peacekeepers hostage - judge Joensen said that Karadzic failed to prove that the UN staff were lawfully detained. "The chamber reminds of the absolute prohibition to take UN personnel as hostage," the judge added. 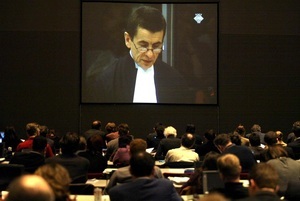 The judge has now turned to the Hague prosecutors’ appeal against the first-instance verdict.